Mark Zuckerberg posted a picture of himself in front of his computer, and an eagle-eyed blogger noticed that his version of Facebook sports a larger-than-usual search box. An unintended leak or not, Facebook competing in search is only a matter of time just as, in retrospect, it was inevitable that Google would integrate social elements deeper into its main product. It wouldn't be a revelation to say that no large-scale ad delivery system is perfect. Reason one is that, at any given moment, only a fraction of the exposed audience is actively on the market for the benefit that the advertised product delivers. Yes, I actually might be interested in switching to your cell phone plan, but talk to me in 15 months when my contract is about to expire. This is the efficiency problem of advertising: in order to reach the few people who are interested right now, the delivery systems by necessity overshoot and spam the crap bejesus out of thousands who promptly tune out. 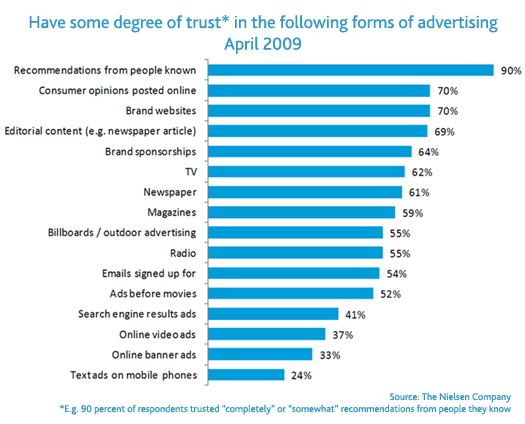 Reason two is that few would admit they believe advertising. People consider the source and recognize the nature of the claims as self-serving and discount them accordingly. This is the effectiveness problem. The advertisers' typical recourse is to bypass rational thought altogether and to beat the claim into the audience's subconscious through incessant repetition. That's what the main media planning principles of "reach" and "frequency" are about -- solving for efficiency and effectiveness. In the picture above, this situation is illustrated by the undesirable lower-left quadrant that says "You Are Here." You are there because most of the existing large ad delivery systems are both inefficient and ineffective. Google with all its imperfections is the most efficient way to deliver ads -- only people who need something now would actively look for something and see an ad for it. And even though it took them awhile, Facebook is figuring out that they have this whole effectiveness thing down. According to many studies (the one below, and others, including my own), friends are the most trusted source of product information. Facebook has hundreds of millions of friends, and Facebook also sells advertising, and now Facebook is putting two and two together to make advertising that comes from friends. But Google and Facebook each solve only half of the efficiency/effectiveness problem. The impeccably timed search ads Google delivers are still self-serving. And the perfectly trustworthy social ads on Facebook still show up at the wrong time. In other words, Facebook and Google each have what the other doesn't, and they are going to fight for it. On Google's end, this is what the whole Search Plus Your World business is about -- fixing the source problem. That's why the push to get people to +1 stuff, and then connect people into social graphs via Gmail and Google+, and then use +1ers as implicit endorsers. Not, you might notice, unlike Facebook. And Facebook needs to fix its targeting. "Interests" have an expiry date and "likes" of pop-culture icons are only tangential indicators of predisposition towards, say, vacuum cleaners. Facebook does have several more precise mechanisms for intent targeting useful for certain categories (a recent change of status to "engaged" is a reliable signal for the wedding industry), but by and large nothing as precise of an intent indicator as search. Hence the picture of Zuck in front of an extra-large search box. Very good points. I'm so glad you started blogging again! Excellent article! I've been watching this trend for a little while. Facebook working on improving SEO and Google becoming more social. Thanks for sharing!! Indeed, I could not agree more! I wonder what is gonna happen when one of these two giants will try to offer the same services than the other! 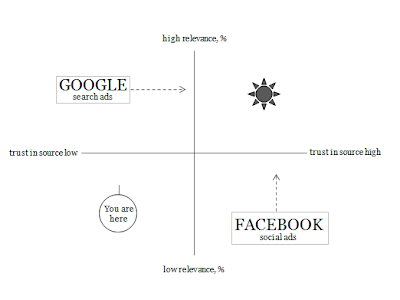 That graph is a really clear way to explain how Google and Facebook are successful in different ways - I wonder who will get to that 'star' first though?